Many runners were impressed by the comfortable ride of the Excite 4. The price tag is wallet-friendly. It has decent durability coming from a shoe of this price, according to a few comments. Several runners loved the freshness of the colors and the style of the 4th iteration of the Excite. Quite a number of reviewers were surprised by the noticeable responsiveness of the shoe. The shoe runs light, observed a significant number of runners. The Gel Excite 4 is available in different width options. It is also used for training by more than a handful of runners. A significant number of users who are up on their feet all day valued the cushioning and comfort of this shoe. A handful of reviews mentioned that it runs smaller than standard Asics shoes. The traction isn’t as good on wet surfaces, as noted by some. It is a little narrower than its predecessor, according to some reviewers. More than a handful of reviewers said that they needed break-in time for this shoe. The Gel Excite 4 remains to be a very solid choice for entry-level runners because of its moderate cushioning with noticeable responsiveness. For its affordable price tag, the comfort, durability, and arch support of this shoe makes it a great buy for anyone looking for a lightweight trainer. The most difficult start to any persons running career is finding the right shoe. As a new runner looking for your first pair of entry-level shoes, the priority is often price, as at that point it is very difficult to know how long your running career may last! So what else matters? You want to choose the right shoe that is versatile and able to meet all your needs, which in my case ranged from 5ks to half marathons. As you progress there is a lot more to it, but one thing I have learned along the way is what really matters the most is the comfort. When I first stepped into the world of running and after countless hours of shoe research, I came across the Asics Gel Excite 4 and these appeared to tick all the boxes, but as they say, the proof is in the pudding. 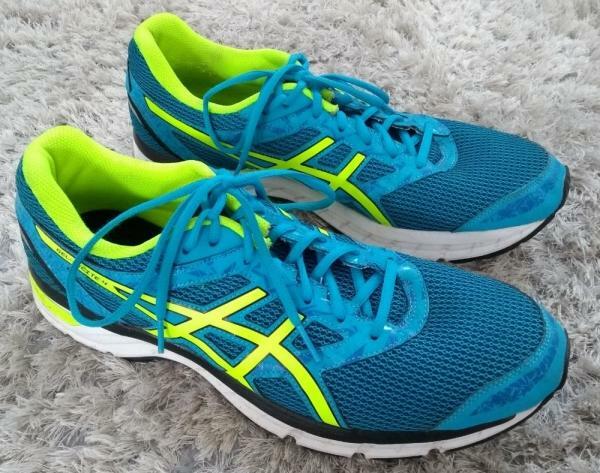 First off, it comes in at a very respectable price, certainly in comparison to some of the premium models, and from my experience, this does not impact or compromise the daily performance of the Asics Gel Excite 4 at all. The Asics Gel Excite 4 works very well as a neutral shoe, offering a comfortable combination of cushioning and stability. Light enough at 255g for the faster 5ks yet also providing enough comfort to complete a half marathon distance without any issues. The mesh upper has been redesigned for better breathability, with wider holes for increased airflow, I never found myself overheating on longer runs. The mesh has proven very durable with no signs of wear. The shoe features the Asics SpEVA midsole which helps maintain shock absorption but at the same time increases rebound, to provide a step up in performance and comfort. I found this did a good job, you want to be able to run in a shoe without knowing it is there, and the Excite 4 certainly achieved that. This shoe features ‘AHAR’, Asics high abrasion rubber outsole, which I comment further below. The idea is that they provide better durability, grip and cushioning but unfortunately this is one of the areas that I feel lets the shoe down. On the plus side, the design of the outsole is very good, with excellent traction and control in wetter conditions. I purchased this shoe half a size up as I always do and found them a good fit, comfortable and they took little time to break in. I suffer from claustrophobia if my toes are cramped in too tight, but in this case, the toe box felt like they had just the right amount of room. There is one negative which is perhaps one of the reasons why this shoe falls into the lower price category, and that is down to wear. It first began at around 250 miles, I started to feel rubbing on the inside collar, just below the ankle, as is evident in the photo below. This gradually increased to the point that it became very sore and on further inspection, it was apparent that the cause for this was down to the severe wear on both heels of the soles, in comparison to other areas and for what I would consider a fairly low amount of mileage. The Excite 4 is said to feature ‘AHAR’, Asics high abrasion rubber outsole…. Wear is to be expected, but despite the ‘AHAR’ the shoe appears to be lacking in durability and that this shoe is most likely more suited to lower mileage runners. For a new runner this is less likely a concern, but when you really start to ramp those miles up, this is something you will need to keep a close eye on. It wasn’t long after that I began to feel some twinges in the knee and knew it was time to start my research all over again. Who would I recommend the Gel Excite 4 for? As an entry level shoe at an affordable price, the Asics Gel Excite 4 is highly recommended to any new runner starting out or those that need a solid daily running shoe to cover a fairly low weekly mileage. Asics uses the running shoe's upper to introduce most of the changes in the Asics Excite 4. The more sophisticated upper comes as a result of the removal of the plastic and cheap-looking overlays. In place is a new suede-like material that promises to add durability and midfoot hold. Midfoot hold is improved as the logo is now integrated as part of the overlays instead of being stitched on top of the TPU overlays in the previous model. More than just delivering a more refined look, the integration of the logo creates a more continuous support from the midfoot to the heel. The upper shows a bigger mesh with larger holes for improved breathability and durability. A slight change in the tongue construction is involved. In the 4th instalment of the Excite, the tongue is not as thick as before, but is now made of a fabric that is more plush. The tongue covers the foot better and continues to keep stress on the top portion of the foot where the laces are tied. The fit of the Excite 4 is basically a redo of the past model. Runners should find the heel and midfoot to be adequately snug with just enough space in the toe box for a natural splay of the toes. This is the kind of fit that mostly favors those with narrow to medium feet. Sizing is standard in the shoe. Asics’ proprietary AHAR+ rubber compound covers almost the entire shoe for durability. It is the same outsole found in the popular Asics Gel Contend 4. The inclusion of blown rubber near the shoe's forefoot is also designed to add traction. There are flex grooves in the midfoot and forefoot for flexibility. A full-length of Asics’ patented SpEVA runs the length of the shoe. It is lighter and more durable than standard EVA. This handles most of the cushioning of the Excite 4. Beneath the SpEVA in the heel is the award-winning Gel Cushioning System for enhanced shock-absorption. The Gel is made of silicone-like substance and is a staple in most Asics shoes. An engineered mesh provides excellent breathability and upper durability. There are stitched overlays in the midfoot to secure the foot. Asics continues to use 3M reflective materials for low-light running. Inside is a removable EVA sockliner for added cushioning and comfort.